Gretchen J. Van Dyke, Ph.D., associate professor of political science, was selected as a Resident Scholar at the Collegeville Institute for Ecumenical and Cultural Research for the 2018-19 academic year. 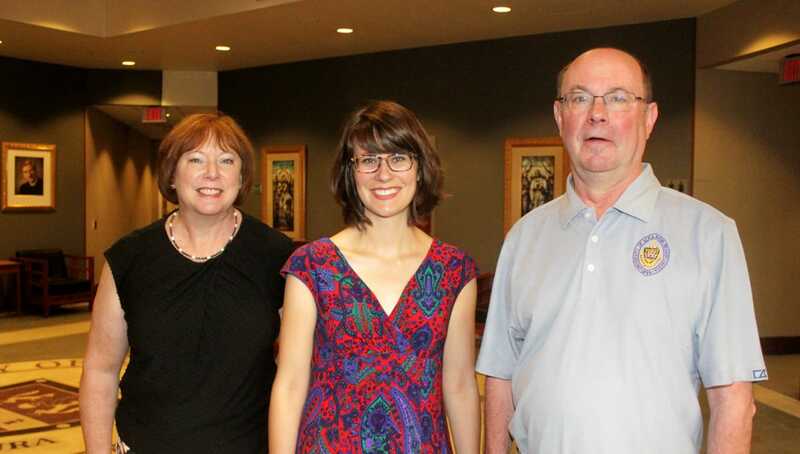 Pictured at the Lilly Fellows Program’s ninth cohort of graduate fellows summer conference, which was held at Scranton, are, from left: Dr. Van Dyke; University of Scranton graduate Sarah Neitz ’12, who is a member of the Lilly Fellows Program’s ninth cohort of graduate fellows; and University of Scranton President Scott R. Pilarz, S.J. Dr. Van Dyke serves as mentor for the cohort and as the University’s faculty representative to the Lilly Fellows Program. Gretchen J. Van Dyke, Ph.D., associate professor of political science at The University of Scranton, was selected as a 2018-19 Resident Scholar at the Collegeville Institute for Ecumenical and Cultural Research in Collegeville, Minnesota. “Utilizing case studies, (the collection) will present how faculty in Jesuit colleges and universities practice their disciplinary expertise in classroom settings while also engaging students in fundamental principles of Ignatian spirituality and Jesuit education,” said Dr. Van Dyke, who noted the project will build upon her nearly 25 years of experience as a faculty member at the University and her 20 years of involvement in the Lilly Fellows Program in Humanities and the Arts, which is an initiative that seeks to strengthen the quality and shape the character of church-related institutions of learning. Dr. Van Dyke, has served as the University’s faculty representative to the Lilly Fellows Program since 2000. She also serves as a mentor for the Lilly’s Graduate Fellows Program and has previously served as a national board member for the program. Dr. Van Dyke joined the political science faculty at Scranton in 1994. In addition to teaching a number of courses related to international relations and American government, she has also taught and developed courses that address contemporary questions of social justice and humanitarianism. In 2011, Dr. Van Dyke completed the Ignatian Colleagues Program (ICP), an 18-month formation program in Ignatian spirituality and Jesuit education offered by the Association of Jesuit Colleges and Universities. ICP provided the foundation for her first-year seminar course, Ignatian Citizenship and Contemporary Political Issues, which she first offered in 2012. In addition, she and her students have participated in the Mid-Atlantic European Union Simulation program since 1996. She received the University’s 2013 Excellence in Integrating Mission and Justice into the Curriculum Award. Dr. Van Dyke earned her bachelor’s degree from Trinity College, and her master’s degree and Ph.D. in foreign affairs from the University of Virginia.